XXL Extra Large 55"X37" shredded mix foam pillow bed is excellent for large breed dog. Handmade in USA. The order comes with 1 Comfortable Suede cover in khaki color on all side and 1 shredded mix memory foam stuffing pillow secured with breathable waterproof internal zipper cover. The pillow will arrive very tightly packed inside a vacuum space bag, please follow the instructions that came with the package to unwrap and allow 12 hours for this product to return to its original shape. Tired of the pet beds that easily tear, are difficult to clean and don't provide your pet the comfort they deserve? Dogbed4less offer the Best material for comfort, support, durability and truly easy to clean cover that blends in seamlessly to your home. Dogbed4less pet bed pillow products are made with high quality durable fabric and highly resilient mixed stuffing material to ensure the ultimate comfort and orthopedic support in balance, which are rarely sold elsewhere due to the higher cost & shipping weight. Our mix memory foam stuffing is 5 times denser and 3 times heavier than other polyfill stuffing, which will not flatten overtime and provide many years of comfort & support under normal use. 2 excellent layers of fabric covers: Internal layer Taffeta breathable waterproof fabric zipper cover to help secure the stuffing. The bed also comes with Microsuede External cover (55"X37"X4" size) at 180GSM weight as seen in many luxury blazer or suit jacket. The external cover is stains, dirt & wrinkle resistant which is interchangeable for top/bottom. The external cover is machine washable and dry-able. Additional replacement cover, more sizes and colors are available here by clicking the Dogbed4less link on the top. 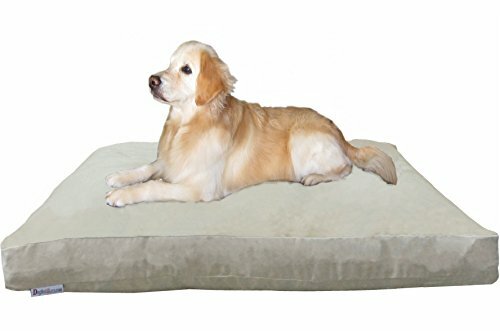 XXL 55"X37" PILLOW - Handmade in USA top quality shredded memory foam pet bed is designed for lasting comfort and easy care. Mixed with new premium poly-fill and shredded polyurethane foam for maximum resiliency and loft to achieve the best comfort and support in balance. 2 LAYERS OF COVER - The bed comes with breathable waterproof internal cover to secure the stuffing and a durable 180gsm suede microfiber fabric external cover in khaki color with extra stitching to prolong the life of the bed, wash after wash. The removable external cover is machine washable / dry-able. REMOVABLE WASHABLE COVER - The suede external cover is stains, dirt and wrinkle resistant which is interchangeable for top or bottom side. The breathable internal zipper cover is water proof on 1 side and water resist fabric on bottom side to allow the air circulation into the foam stuffing. ORTHOPEDIC SUPPORT - 8" thick overstuffed insert will support your large dog up to 140 lbs. Mix shredded memory foam stuffing allows better airflow between foam clusters for a cool, breathable sleep surface. Our pillow is 5 times denser / 3 times heavier and will not flatten overtime compare to other poly-fill stuffed beds. HIGHEST QUALITY - Premium materials, smart features and quality construction providing the perfect cozy dog pillow with superior durability while ensuring the body is properly aligned without painful pressure points to relieve achy joints, arthritis and hip dysplasia. Try it yourself and you will love it too! If you have any questions about this product by Dogbed4less, contact us by completing and submitting the form below. If you are looking for a specif part number, please include it with your message.